Source: Division H- FY2016 Departments of Labor, HHS and Education and Related Agencies, contained in the Consolidated Appropriations Act of FY2016. 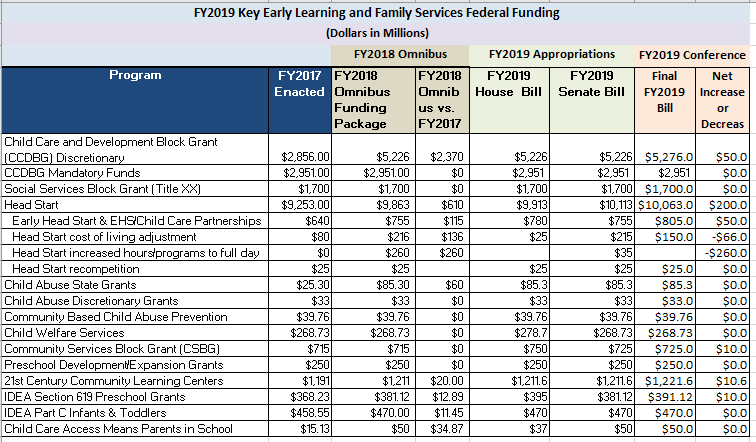 Note: *With regard to the Head Start increase of $576 million, $429 million of that funding goes for competitive expansions to full day programs ($294 million) and an increase of $135 million for Early Head Start (including EHS/Child Care partnerships). To read the House Majority Summary of the 2016 Consolidated Appropriations Act, click here. To read the House Democratic summary, click here. 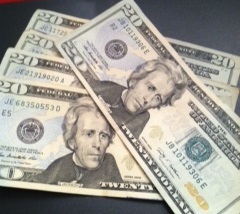 Another end of the year bill, The Protecting Americans From Tax Hikes Act of 2015, includes changes to the tax code which are estimated at losing about $623 billion over the next 10 years. Some of the provisions make sections of the current tax code permanent (instead of allowing them to expire), some make modifications, and some repeal some sections of the code. On September 28, two days before the end of the fiscal year, Congress approved a Continuing Resolution (CR) to continue federal funding through December 9, 2016 (P.L. 114-223). A 10 week CR was necessary because the fiscal year ended September 30th and Congress was scheduled to adjourn (i.e., recess through the November elections). Funding was largely continued at FY2016 levels (a freeze) until final determinations can be made in December. Note: An across-the-board spending reduction of .5% was applied in order to keep spending below budget caps. FY2017 Continuing Resolution (PL114-254), Expired April 28, 2017. Congress adjourned in December 2016 without passing a full year continuing resolution (CR). Instead, a short-term continuing resolution funding the government through April 28, 2017 was enacted. In order to stay within budget caps enacted as part of the 2015 budget law, a .19% across the board cut was applied. 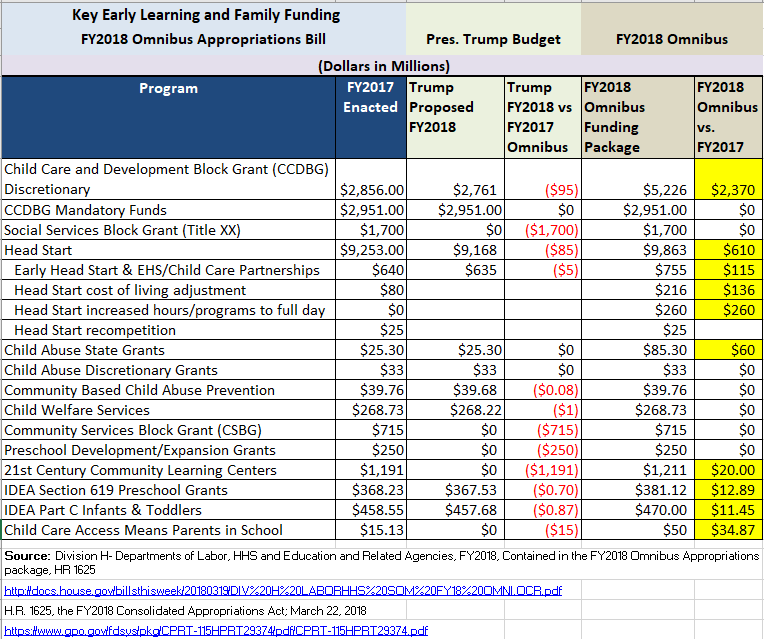 President Trump's Proposed Funding for Key Early Learning Programs Compared to FY2017 Omnibus Appropriations and FY2016 Funding is below. FY2016 Consolidated Appropriations Act. The FY2016 Consolidated Appropriations Act (P.L. 114-113) is a $1.15 trillion package of year-end appropriation bills. Within this measure is funding for the FY2016 Labor, HHS and Education programs, which received an increase of $5.4 billion compared to FY2015. 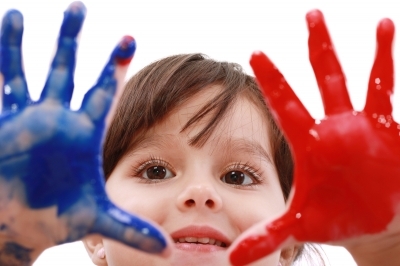 Programs under the Department of Health and Human Services, Administration for Children and Families, received an increase of $1 billion (primarily for the Child Care and Development Block Grant and Head Start). FY2018 Senate Labor, HHS and Education Appropriations bill: On September 7, the Senate Appropriations Committee approved the FY2018 Senate Labor, HHS and Education Appropriations bill. 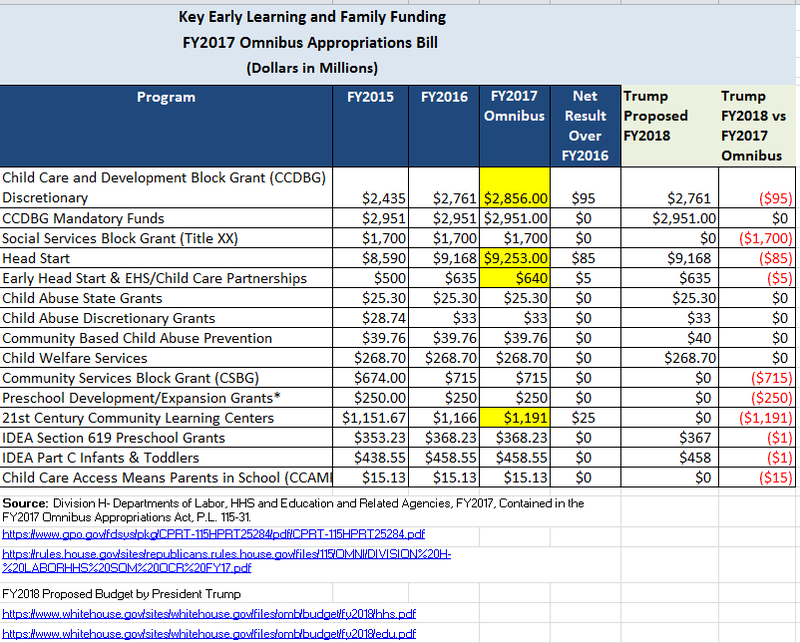 For early learning programs, both the Child Care and Development Block Grant (CCDBG) and Head Start were frozen at FY2017 funding levels. For more information, see the bill summary, the bill text, and the Committee report. P.L. 115-141 was enacted on March 23, 2018 to fund government operations through September 30, 2018 (the end of fiscal year 2018). On September 18, the Senate approved HR 6157, the “minibus” reflecting a combined FY2019 Department of Defense and Labor, HHS, and Education appropriations conference report by a vote of 93-7. See table below for additional detail. The measure also included continuing funding authority through December 7, 2018 for annual appropriations bill not yet approved.